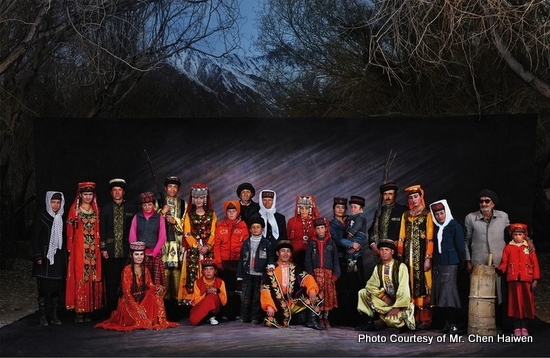 There are more than 330 thousand people in Tajik nationality of China and they are mainly distributed in Tashkuergan Tajik autonomous county situated in the southwest of Xinjiang Uyghur Autonomous Region. The Tajik nationality has its own language. They make a wide use of Uyghur language and they believe in Islam. They engage themselves in stock raising and they farm also. They live a half-resident and half-nomadic life. The Tajik people have a tenacious and unconstrained character. The eagle stands for hero in the old stories of Tajik. The herdsmen enjoy playing a kind of piccolo called "Nayi" which is made of the wing bones of eagle. They regard the simulation of eagle soaring as the most excellent posture of dancers. The tajik nationality is famous for being good at equitation. The athletics on the back of horses, such as holding sheep and "hanging Poki "(polo) are the favorite mass sports and entertainments.